Olympic rings over Sydney opera house and Sydney torch. The Medal Ceremonies Sub-Program promoted a competition to select a design for the Olympic victory medals. In July 1998, invitations were sent to 18 prominent artists, sculptors, jewellery designers and design students but entry was open to all. Four months later, contestants submitted their designs on paper together with actual size replicas that were judged by a panel of six experts. The unanimous choice was the design of Polish-born sculptor Woijciech Pietranik, whose portfolio included coins designed für the Royal Australian Mint. The medals were 68 mm in diameter, 3 mm thick at the rim and 5 mm thick at the highest point of the relief. 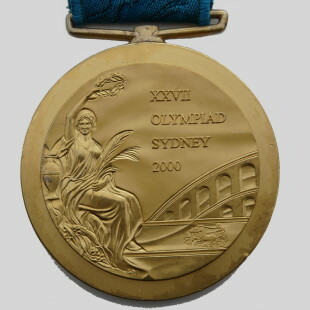 The obverse of the Sydney Olympic medals featured the requisite subject of Nike the Goddess of victory, holding a wreath overhead with two palm fronds wrapped in her left hand. She was seated beside a Grecian urn and below her were sprigs of wattle, the Austrailian national flower. Beside Nike were the traditional Cassioli stadium representation, and a chariot pulled by four horses. The reverse depicted the Sydney Opera House and Sydne`s futuristic Olympic Torch. The five raised Olympic rings punctuated the centre, and the name of the event was engraved on the outer rim. Winning athletes were able to have their name engraved on the obverse side, where space had been allowed for that purpose. The 750 gold medals were 99.99 per cent pure solid silver with 5 gm gold plating, the 750 silver medals were 99.99 per cent pure solid silver, and the 780 bronze medals were 99 per cent bronze with one per cent silver. The medals were struck at the Royal Australian Mint in Canberra and the Perth Mint. 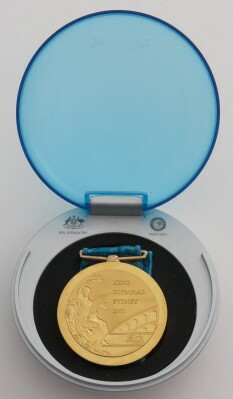 All Sydney 2000 medals were hung on blue ribbons made by the Woolmark Corporation and bore the legend "Sydney 2000" in silver embroidered lettering, as well as the SOCOG fluid energy look.